My cooking adventures have been few and far between. I’ve been cooking most nights, but rarely trying anything new. The kids ate it. It was okay. Definitely not light and fluffy. During the next grocery trip, I bought yeast (and bread). The result was better. Bread, not so flat, still kinda thick and crusty. My daughter refuses to eat the crust of store bought bread. She calls it skin and complains loudly and frequently about her peanut butter and jelly sandwiches. Nor will she eat raisins. This bread, the crust is actually crusty and chewy and kind of tastes different from the rest of the bread. She gobbles it up without a complaint or whine about how she doesn’t like the skin or raisins. This bread may not have turned out as expected, but the absence of temper tantrums during a meal was worth trying it again. Oh yeah. Did this myself with an old box mix in the bread machine. I knew the mix was old, but the machine didn’t really work well either. I gave up and threw it in the oven, no good. Tossed. Still have to try something decent. Need yeast. But there’s something *satisfying* about punching down dough and kneading it. LOL And then you get to punch it again! hahaha. I’ll go a long way to avert kid drama. 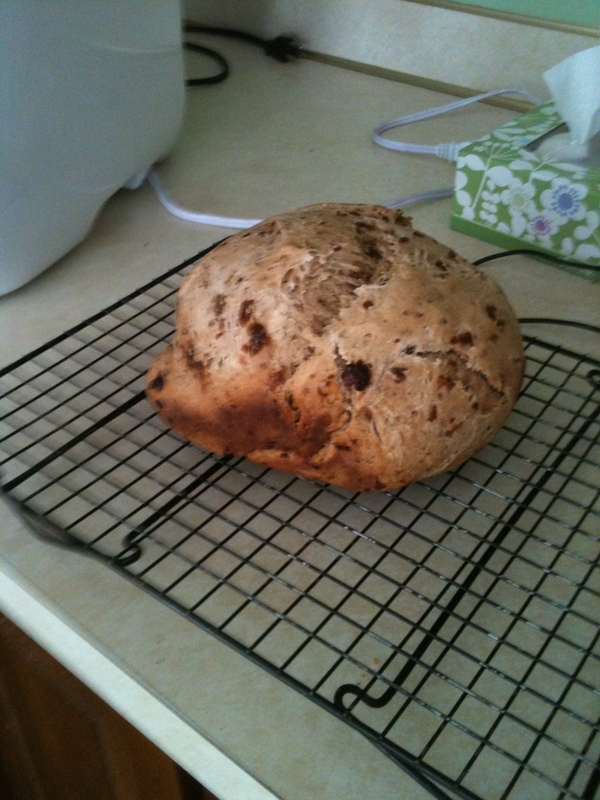 Go homemade bread! I don’t care what the bread looks like. Homemade is so much tastier than the “embalmed” bread we buy at the stores. I don’t make bread because I would eat the whole loaf when it comes out of the oven and of course, slather it with enough butter so it would drip off the warm slice…Mmmmm…..
You and me, Janet. I have a friend who makes bread often, and I’ve been the recipient of her generosity. I’ve had to ask her not to make me any more. I do inhale the thing. OMG! IT’s soooo good. the crunch crust, the chewy insides. Yes pure heaven warm and dripping in butter. 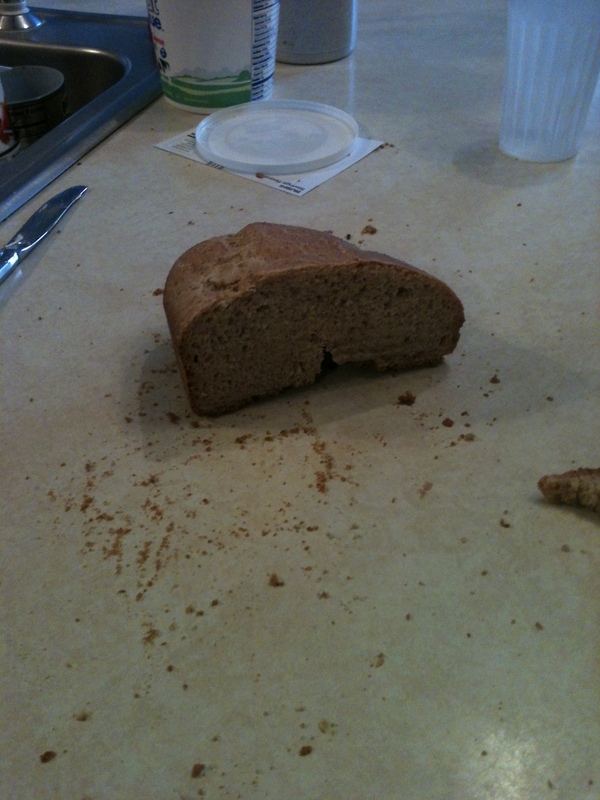 We didn’t have bread makers when my girls were little and occassionally experimented with making bread from scratch. But those things would have to be a whole lot easier than the earlier method, Joselyn, to keep me from throwing the kids in the car and going to the store. (Of course, I only had two kids and not 3 LOL) Now-a-days, we can find some pretty good stuff in the store bakeries. If you happen to have a Central Market or a Whole Foods near, that’s good, too.